If you want your child’s bedroom to be a place that they enjoy spending time playing, relaxing and sleeping, you’ll need to think about the lighting. It’s often not sufficient to rely on a single ceiling light or a few lamps to create the right type of lighting. Here are some ideas for lighting in your child’s bedroom. You’ll generally need three lighting fixtures within your kids’ rooms. Pendant lighting above the bed looks great and provides an overall source of light, whilst a table lamp is ideal for when they are reading in bed. You can think of the rule of three as: accent lighting, ambient lighting and task lighting. Task lighting is important for reading and doing homework, whilst ambient lighting is important for relaxation. Lastly, accent lighting should be used to highlight decorative features. It’s important to invest in good lighting that works for your child at their current age that will also work for them years down the line. For example, stylish and colourful pendant lighting will keep your child happy, but can also grow with the room, unlike a character shade. 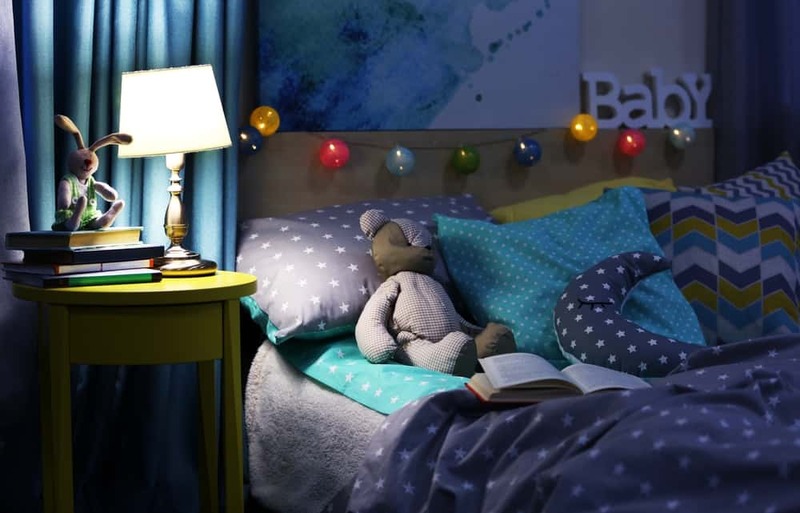 If your child’s room has a theme, why not ensure that the lighting compliments it? For example, for a nautical or pirate themed room, opt for porthole lights that wouldn’t look out of place on a ship. For a fairy princess theme, cover the headboard of the bed with fairy lights, or have a dramatic chandelier as the centrepiece. The key to lighting is to layer it with the rule of threes. A great way to layer lighting is to invest in dimmable LED lights, so you can swap from bright lighting to relaxed ambient lighting easily. LED lighting is a good investment, as it doesn’t waste much energy as heat, so you can replace a 50w halogen bulb with a 5w LED bulb for better light and reduced energy bills! This makes it ideal for a family home. There’s no artificial lighting that can match up to daylight, so try to make the most of it. You should keep window dressings such as curtains minimal, and keep the walls painted white to reflect light. You could also consider installing a skylight, if the windows don’t let in much light. Make safety a priority. Cover up cables, make sure that lights are attached to the wall safely and light switches are working properly. Opt for dimmable lights – they have the same premise as a night light without costing extra. Have fun – although your lighting should grow with the room, it doesn’t mean you can’t have fun! There are plenty of temporary fixtures like fairy lights and bedside lamps that are bright and colourful, and easily removed when your child grows out of them. Invest in LED lighting for highly-customisable, safe and affordable lighting. LED bulbs have a higher lifespan, so they’ll hardly ever need to be replaced. What lighting would you choose for your child’s room?